You may notice that the newsletter is a bit late this week, but if you were around campus this week you know why. This year we have about 800 players and coaches joining us on the Moshi Campus. In addition to those students from the Arusha Campus, these students represent 13 different schools from around Tanzania. This was the 18th edition of Sports Weekend and the largest yet. Events like this do not happen without a lot of planning before and work during the event. I must thank Robin and the PE department for all their careful planning as well as every other person that worked so hard to make this work. It was a community effort as students, parents and all our staff contributed to the success. We are planning a special newsletter this week with photos and all the results from this weekend. Over the next few weeks we slightly switch gears as we have an Outdoor Pursuits going out on Sunday. 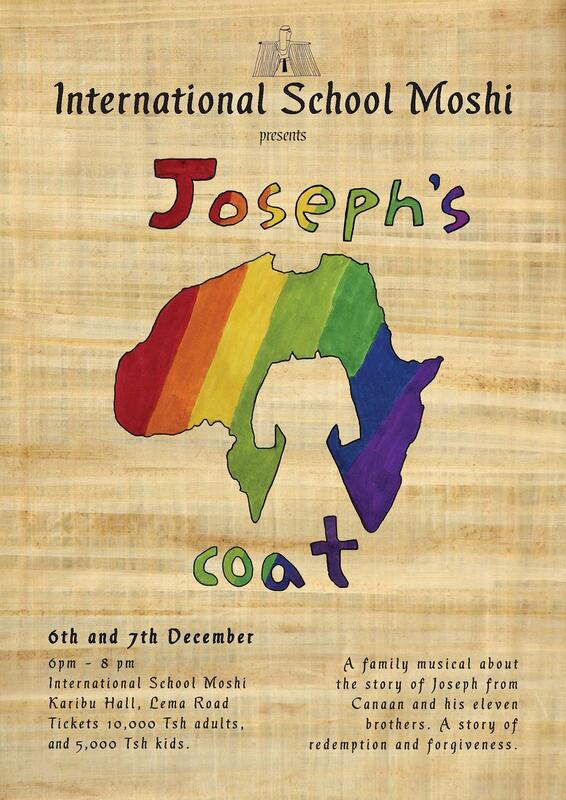 Please also note the upcoming production of Joseph’s Coat as advertised below. Meet Tumaini. Her name means hope in Swahili. You may have noticed her standing proud at the entrance to campus. A symbol of 3 years of collaboration involving many members of our community, both people who are still here and others who have since moved on. Tumaini is the face of Sparkling Elephant Project here in North East Tanzania. Sparkling Elephant Project is a campaign for the conservation of an endangered species, the elephant. 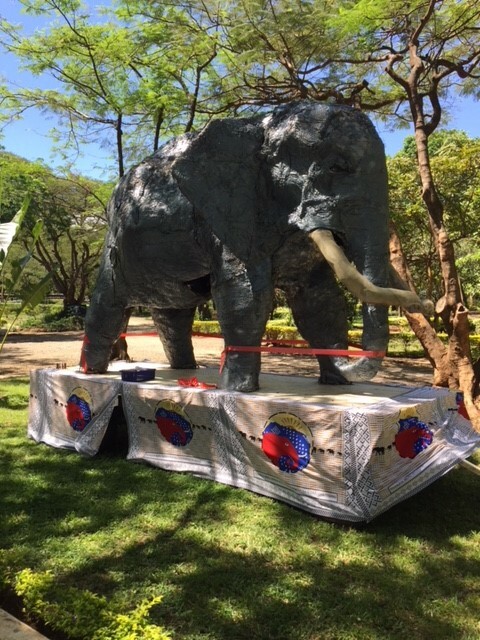 The global aim is to gather communities all around the world that will construct their own Sparkling Elephant in order to raise awareness of sustainable ways to mitigate human-elephant conflict. In this region, the focus remains within Kilimanjaro’s last migratory elephant corridor. Over the years, Tumaini attended a number of important events as the CAS ambassador, representing our voice against elephant poaching and the Ivory Trade. These were the Kili Marathon, the Weru Weru Secondary School educational play and quiz show, the elephant and bee gala dinner (at which Tumaini was sparkling from inside!) and the long drive to a weekend spent at the Kitenden Secondary School, inside Kilimanjaro National Park. 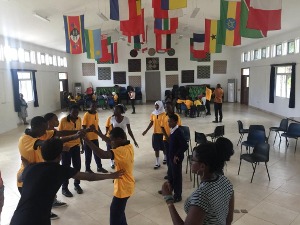 Here, our students engaged with the Maasai students, discussing sustainable strategies to mitigate human-elephant conflict. As many of you may recall, in August this year, our CAS group set up a 1km beehive fence at the village of Tinga Tinga in West Kilimanjaro, close to the Kitenden elephant corridor. 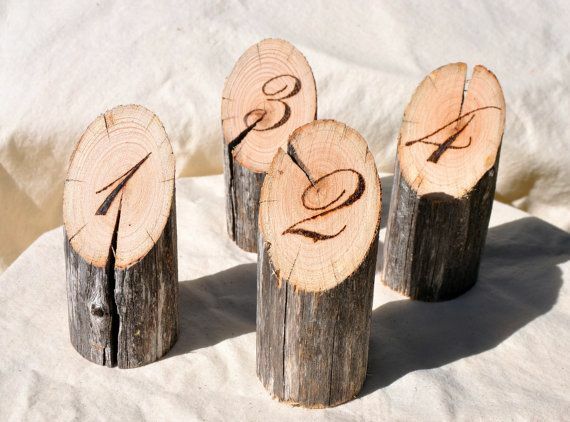 Amazingly, five hives are already occupied! However, the job is not done. More beehives are needed alongside plans to increase the protected areas. 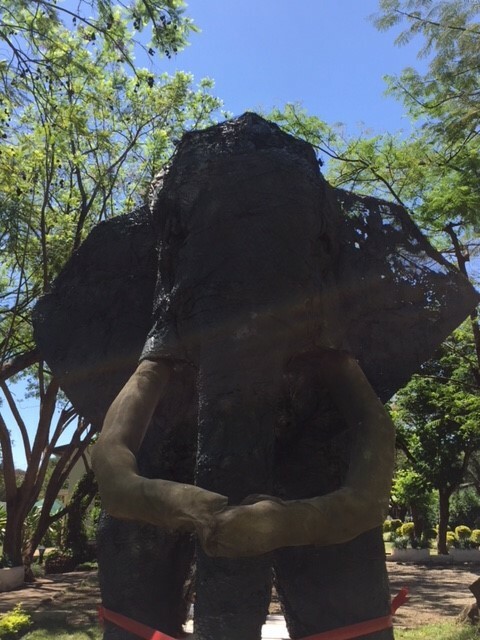 Now, Tumaini’s job at the entrance to our beautiful campus, is to remind us, on a daily basis about the ongoing plight of elephants in Africa. We share a responsibility as the generation of tomorrow, #generationelephant, to continue to take action. A huge congratulations and thanks to everyone involved in the project from its inception. able to familiarize themselves with us. We look forward to working with them each week! 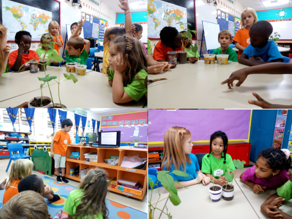 The Eco School Initiative strives to make schools all around the world more sustainable and eco friendly. This academic year ISM has begun to collaborate with them, leading to the formation of an Eco School Project CAS here at school. 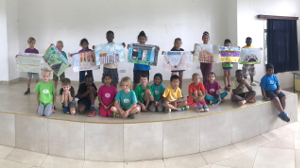 As part of the scheme, schools are asked to select and focus on a few of the Eco-Schools Themes, these are linked to the UN’s Sustainable Development Goals. Within our CAS group we have four task forces each one with its own focus: Litter, School Grounds, Water and Waste. Recently, our Waste Task Force has made great progress on a major project, limiting the amount of single-use plastic found in school. We’ve successfully switched from plastic cups to paper cups at the duka. While the jury is out regarding the amount of energy used to produce plastic and paper cups, we know that these cups will biodegrade much more quickly than plastic, and will not release the same harmful toxins as broken down plastic. as well as having found an eco friendly alternative, made out of sugarcane waste for about 6500 plastic plates used during sports weekend. Our D1-led counterpart has also made huge strides, they’ve created charcoal briquettes out of recycled material, and are currently working on a vertical garden outside the Biology Lab. Part of Eco Club’s role is to record and celebrate all the great green initiatives happening at ISM – please let us know if you are doing something to make ISM greener! Look out for our next update, coming next week! The big news this week is sports weekend. Please look for a special newsletter in the next few days about this event. Please also note that there is a PYP swimming meet at the Arusha Campus on Friday. Invited swimmers should have received the letters already. 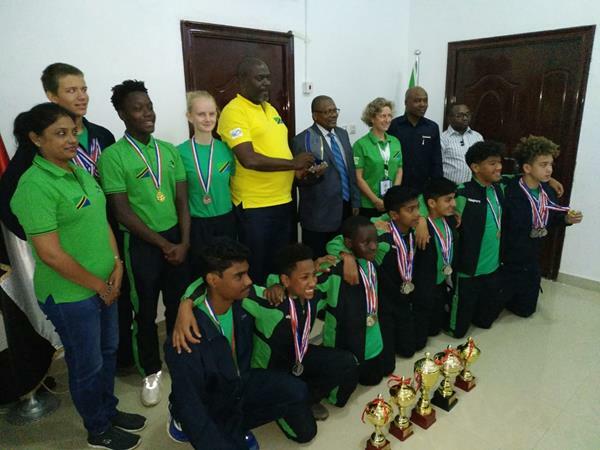 On Saturday Arusha will be hosting our swimmers for the secondary swimming event as well. ISM Moshi would like to say a big ‘thank you’ to Mary Fitzpatrick – mother of Chris (also a Team Tanzanian swimmer in Sudan), Dominik and Gabriel and wife of Rick – who tirelessly promoted swimming during the years that she and her family were part of the ISM community before moving to Namibia. 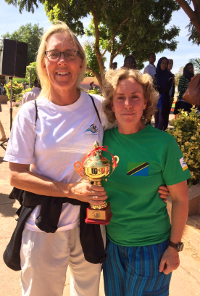 Together with Debbie Bachmann, she took part as a Tanzanian swimmer in the 3k open water race in the Blue Nile coming in 2nd behind South Africa. Hongera sana Mary!! 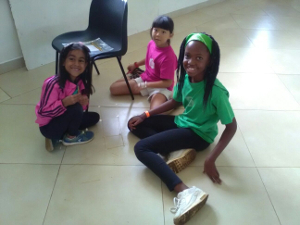 In Primary, the teachers and students have been at their busiest this week, with Summative Assessments, rehearsals for PYP Sharing Assembly, a chess tournament and the Inter-House Tech challenge were some of the main features this week. Thank you, Ms. Debbie, for organizing the Technology Challenge. It went beautifully and it was such a great way of promoting Agency across all PYP. There were various discussions going on as the students figured out how to build a spaghetti tower that would hold a marshmallow at its top. With very limited resources the children used their creativity and design skills and came up with very interesting forms. It would be fun doing it at home as well, try it. Our 12 Chess masters from P4 to P6 did us proud in St Constantine’s and we had many of them reach the finals and one winner; Sahil Chauhan from P6. In the coming week, most classes will be finalizing their Summative Assessments which should be done independently and in school. With 3 weeks away from the end of the quarter, the children are hyped up. We are promoting the IB Learner Profile, “Principled,” and it would be great if they found ways to demonstrate this attribute at home as well. Two birthdays, practice for our sharing assembly, the Primary Tech Challenge, assessments for reports and finding out more about what actions we might take to help protect endangered animals. It’s been a busy week in EC. It was fantastic to see many of our EC children attending this week’s sports weekend. 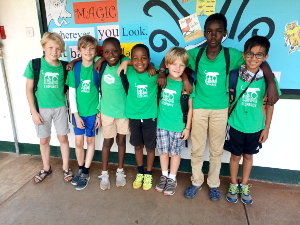 Some of them took their first brave steps towards future sporting events by attending athletics meets over the past weeks. I was really impressed this week with our children. Through games, discussions and hands on activities they were happy and able to show the developing range of language, math, music and art skills that they are working on. 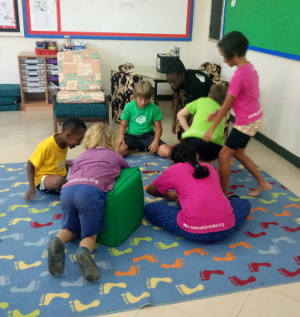 This week marked the end of the group work on biomes that the children were working on. Their posters will be on display on Monday and you will be able to see them after our PYP sharing assembly. We will share a bit of what we learned in assembly. We shared a few more plant projects as well this week. Thank you to all of you who helped us with the work. Everyone was able to explain the process they took and the outcome of their projects. Each presenter was able to answer questions from their peers. It is always much better when we discover facts for ourselves instead of just being told what will happen. In our art explorations, the children have been experimenting with lines and colour. They created leaf patterns with different types of lines drawn in crayon and began to paint over them with their chosen colours. They will complete their work this coming week. P 2/3 have spent this week working hard on completing their research and pictures of houses from the past in order to be ready for our PYP Sharing Assembly on Monday at 10:35am. We have a range of houses that begin in 16000BC all the way to Carve Cave Houses with a particular focus on Cappadocia which only came about in 500 AD. Students have looked at different geographic locations around the world and have inquired into what material the houses were made of, as well as the traditions that were popular in those areas. There has also been a lot of excitement amongst the students for Sports Weekend which kicked off on Friday. The P 2/3 students took part in a house tech competition on Friday morning along with the rest of the primary students. This was a fun event, and we thank Ms. Deborah and Ms. Cathy for helping organize this for us. 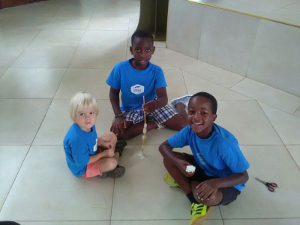 The P4 students had a great week. We have enjoyed learning about ways to increase and continue patterns as well as see patterns in the different Math concepts we have been working on. They have also been working very well on their Summative Assessment which will be in the form of posters and various projects. 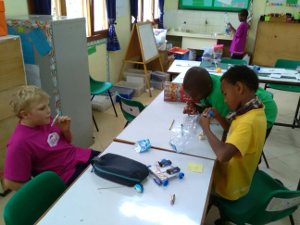 We will be sharing some of our projects in the PYP Sharing Assembly on Monday 26th November, from 10:35 for about an hour in Rafiki Hall. You are welcome to join us! In the coming week, we will continue with patterns around us in Language as well as in Maths. We are also encouraging students to bring in materials related to snakes for our personal inquiry. So far we have a book and snakeskin. Our schedule next week remains regular with Library on Tuesday, P.E. on Thursday and Swimming on Friday. From a tech challenge to Thanksgiving to playing chess, the P5 have been busy this week using their creative and open minds to solve problems and take risks. Thank you to all of those who contributed food for our feast. The children all shared something they were grateful for, and we also made gratitude posters to show how thankful we are for all that we have in life. The well balanced P5 crew even managed to take their Geometry tests after building a tower of pasta. Next week, we will continue working on our narratives and typing our edited drafts. We will be finishing up our unit with a fun summative assessment where students create a game to show what they have learned about Migration with risks, challenges, and responsibilities. Please remember water bottles and hats, as the temperatures are getting warmer. We also had a few forget swimsuits this week, so please remember our swimming day is on Thursdays. stories, working with decimals and starting to think about our new Unit of Inquiry on media.